“Bird Box” is a Netflix original movie starring Oscar winning actress Sandra Bullock that was released on Dec. 21, 2018. Photo from wikipedia.org. “Bird Box” popped up on Netflix in December, and despite there being no promotion for the film, it took social media by storm. Netflix saved thousands on advertising by putting the film in the spotlight and letting people watch and then tweet about it. 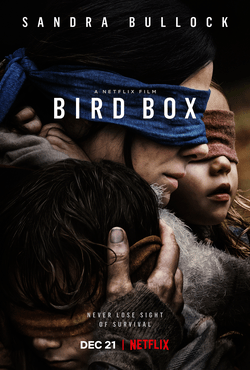 “Bird Box,” a Netflix original movie directed by Susanne Bier and starring Sandra Bullock, is based off the 2014 novel by Josh Malerman. The film takes place in modern day America during an epidemic where a foreign entity makes people commit suicide. Some see their greatest fear and then commit the act. The way to survive: do not look outside and stay indoors. The plot follows Bullock’s character Malorie in two different time periods: the beginning of the epidemic and five years later. When the epidemic happens, she finds herself in a large house with a large group of people, including legendary actor John Malkovich, who played a rugged character named Douglas. Five years later, Malorie has two kids with her as they are traveling down a river to safety. The two intertwining plots kept the pace of the film moving fast. It was one of the strong points of the film. The movie’s name comes from the fact that birds are the only animal that can sense the presence of the supernatural entities. Bullock’s character carries several with her throughout the film to alert her and other survivors when to close their eyes. “The Bird Box Challenge” was also something that occurred because of the film. It started as a meme or a joke, but people then decided to actually try to do different things like drive blindfolded. Some ended up in the hospital. Although this film has been compared to “The Happening,” I’d have to say “Bird Box” is so much better. It has a unique feel to it and is well done. Even if you don’t like it, you’ll be glad you watched it. The payoff at the end of the film got mixed thoughts. I was content with it. I feel that it made sense. Rather than trying to throw the viewer off it had a good payoff. This film has had a lot of controversy on Twitter, especially on whether or not it was good or bad. Watch for yourself. Like the film or not, it’s worth watching. It’s not often that a film comes around that gets such mixed reviews and watched by so many like this one.